Researchers studied the variations and fluctuations in the length of day over a one to 10 year period between 1962 and 2012. (Phys.org) —A pair of researchers, Richard Holme of the University of Liverpool in the U.K. and Olivier de Viron of the University of Paris, in France has found that the length of Earth's days follows a cyclic oscillation pattern every 5.9 years. As the two describe in their paper published in the journal Nature, the variations in day length were discovered as part of a study examining day-length over the past 50 years. The time it takes the Earth to spin once around its axis varies by milliseconds on any given day. This is due to the impact of weather patterns, ocean currents and other factors. But the Earth is also subject to other forces that can cause the length of day to vary over the long term or even for short "jumps" of time. In this new effort, the researchers looked at data from the past 50 years and then filtered out those short term forces that cause daily fluctuations in day-length. In so doing, they found what they describe as a ten year "decadally varying trend" a 5.9 year cycle of day-length oscillations and times when the planet seems to jerk, temporarily changing the length of the days that follow. Unlike the ten year trend (believed to be caused by changes in the Earth's core) and the episodic jerks (scientists have detected 10 such events since 1969) the 5.9 year cycle was unexpected. Every 5.9 years, they claim, the planet undergoes a period of several months where the length of each day is longer or shorter than "normal." The researchers don't know what causes the cycle but suspect it has something to do with the core-mantle boundary. Scientists are also interested in learning more about the episodic jerks that alter day-length for several months at a time—this new research has revealed that during each event, the Earth's geomagnetic field undergoes a similar effect. Scientists don't know why either occurs, but suspect they are connected. Research into Earth's day-length changes as well as studies seeking to better understand the true makeup of the planet are not just academic pursuits—gains in understanding are used by geologists and engineers in mining and exploration efforts. Variations in Earth's rotation (defined in terms of length of day) arise from external tidal torques, or from an exchange of angular momentum between the solid Earth and its fluid components. On short timescales (annual or shorter) the non-tidal component is dominated by the atmosphere, with small contributions from the ocean and hydrological system. 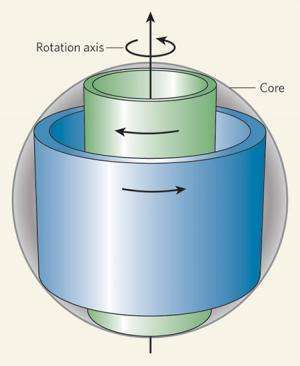 On decadal timescales, the dominant contribution is from angular momentum exchange between the solid mantle and fluid outer core. Intradecadal periods have been less clear and have been characterized by signals with a wide range of periods and varying amplitudes, including a peak at about 6?years. Here, by working in the time domain rather than the frequency domain, we show a clear partition of the non-atmospheric component into only three components: a decadally varying trend, a 5.9-year period oscillation, and jumps at times contemporaneous with geomagnetic jerks. The nature of the jumps in length of day leads to a fundamental change in what class of phenomena may give rise to the jerks, and provides a strong constraint on electrical conductivity of the lower mantle, which can in turn constrain its structure and composition. This Unexplained Earth Jerking, that happens simultaneously physically and magnetically, simply must be because of the Electric Universe and Vacuum Mechanics having a tug-of-war. No way anything scientific could cause this, right? "The time it takes the Earth to spin once around its axis varies by milliseconds on any given day. This is due to the impact of weather patterns, ocean currents and other factors ... Every 5.9 years, they claim, the planet undergoes a period of several months where the length of each day is longer or shorter than "normal." The researchers don't know what causes the cycle but suspect it has something to do with the core-mantle boundary." It seems that the worldview which is informing these views (and AGW, too) is that of a disconnected universe. But, isn't this rather convenient for us? Re: "No way anything scientific could cause this, right?" The problem is that you're referring to science as though it is a worldview, rather than a methodology. And yet cosmology and astrophysics are incredibly speculative sciences to base a worldview on. For the record, slight-yet-significant variations have now been observed with respect to the radius of the proton, the gravitational "constant" G and radioactive decay rates. Look at the chart for the measurements of G at http://www.nature...0a.html. The measurements are not sticking to the error bars. What exactly is this worldview from which all of this ridicule emerges? It seems to be impacted neither by observational discrepancies nor the apparent failure to account for 96% of the universe's energy/matter. There appears to be quite a bit of faith at play that all of these anomalies will ultimately be resolved within the existing framework, without dramatic rewrites to existing models. Critical thinkers generally don't look to faith as inspiration for belief. That's a pattern of thought which has been handed down to us from former generations. Science was supposed to help us to minimize the role of faith in our beliefs. I wish you were actually funny. Don't go confusing him with facts. But you are aware that a person standing next to you has more gravitational effect on you than Jupiter? I know, that requires this thing you hate: math. Do you mean string theory? I take it and show you where it's wrong. That's science for you. Take it or leave it. BTW the Sun and tornadoes do rotate in the same counter-rotating way. So which way is 'counter rotating' again? 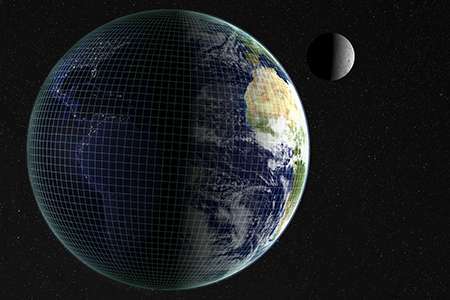 Illustration of the dense aether model explanation of periodic variability of period of Earth rotation. One has to love a theory that explains all but predicts nothing. I think the variability is caused by the collective banging of heads that occurs with periodic dense aether pronounciations. (which are entirely and tirelessly predictable). @Anti: If by gravitational effect you mean gravitational force then this is not true. Mass of Jupiter = ~2 x 10^27 kg. Mass of person next to me <= 100 kg. Ratio > 2 x 10^25. Maximum distance to Jupiter = ~6.5 AU = ~1 x 10^12 meters. Ratio = 2 x 10^12. Ratio squared = 4 x 10^24. So Jupiter exerts at least 5x greater gravitational pull on me than a moderately heavy person standing right next to me (OK, even a 100 kg person is not a sphere, but close enough that a factor of 5x more than covers it).